A. S. Helwig, a southern Alberta artist, utilizes techniques such as glazing and underpainting to explore the prairie landscape. 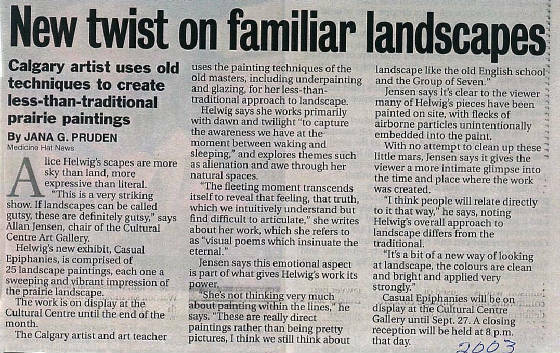 "I am working with the imagery of dawn and twilight to capture the awareness we have at that moment between waking and sleeping," says Helwig. "The imagery that I have been working with has become spiritual and dreamlike. The images are quick glances we have of the landscape as we move through it." Themes of alienation, awe, personal epiphanies and prayerfulness emerge. The fleeting moment transcends itself to reveal that feeling, that truth, which we intuitively understand but find difficult to articulate. These are visual poems which insinuate the eternal into our understanding of the immediate. Alice S. Helwig was born in Lethbridge, Alberta in 1962. From an early age she drew and painted. In fact, Alice has painted in acrylics since she was 14 years old. Often her plein aire subject was the coulee hills close to the family home. Upon graduating high school in Lethbridge, Alice took a two year commercial art program at the Medicine Hat College. While at college Alice continued to paint. Her watercolours were included in an international show in Sherbrooke, Quebec. After graduating from the Visual Communications program, Alice registered at the University of Lethbridge. Under Pauline McGeorge, Alice continued to study painting. In 1985 she graduated - her degree a Bachelor of Education, with distinction. Alice's work appeared in the juried University show. Also her paintings were selected to be in the Southern Alberta Creates Show at the Southern Alberta Art Gallery in Lethbridge. Since then her work has been shown in Southern Alberta and online in the USA. Looking for adventure Alice moved to Fox Lake, a small remote Indian village in Northern Alberta. There she taught English and art. She continued to maintain a studio in her home. It was at this time that Alice first worked on murals. She encouraged the students to express themselves and create murals in the school portables. Later Alice would live in Mayerthorpe before moving to Calgary where she presently resides. Alice remains an art educator. Currently she works as an art educator while maintaining a studio in Calgary. The theme in her work has varied from figurative compositions, landscapes, to interiors. Alice has also worked in a variety of materials ( watercolour, clay, oil paint, pastels, graphite, and stained glass). She has returned to acrylic paint and the prairie landscape. It is what she began with and where her passion lies. A. S. Helwig is represented by Mountain Galleries in Jasper, Banff and Whistler. Young children love to draw; whether on paper, walls, or furniture, it is an activity that engages the mind, the senses, and the heart. Somewhere along the path of childhood the spontaneous drawings stop, and self-consciousness and insecurity replace the former carefree attitudes of young drawers. Many adults (including me) are embarrassed to even attempt an artistic rendition of an object or person. Why do most children eventually stop drawing and become adults who are intimidated by their perceived lack of skill? Is this just a fact of human development, or are there underlying causes that lead to this arrest of artistic growth? Is there anything that can be done to preserve uninhibited creativity from childhood to adulthood? Alice Helwig, who has been an art educator for over 20 years, recognizes the phenomenon all too well. She taught a class for adults entitled, “Drawing for the completely intimidated,” and presently continues teaching drawing and painting for both kids and adults with the City of Calgary. Helwig, a professional painter herself, shares her thoughts and experiences on the importance of encouraging young drawers to preserve that sparkle of creativity and self-confidence for life. WP: Why are young children so keen to draw and create? Drawing is a natural way to express themselves; children draw before they learn how to write. It’s a way for them to communicate, and to make sense of their world. There is something very compelling about making marks—historically we’ve been doing it since time began. And there is no denying that it is a joyful activity. When I teach younger kids rarely do I have to tell them what to draw; they have lots of ideas. When I teach Adults—well that’s another story. WP: Isn’t it a fact that some people just cannot draw? When people ask this of me, I always think of my mother- Rosella Helwig. An arts advocate, she would respond, “Not all kids are good at math or language arts, yet we have the expectation that we can teach them to become better at those subjects. How is it different with art?” Not all children are natural drawers—but through observational drawing we can improve their skills. I really believe this is true. WP: Is it important to teach art in the school system? In our school system there is such pressure for standardization of testing. Most people would say that they are in favour of creative thought and creativity, but when faced with open-ended tasks they would prefer a more decisive and prescriptive path. Creativity means that you are unsure, that you need to examine each of the possibilities; that you need to take a risk and you could be wrong. This is the single most important reason why art should be taught in our schools (and taught by trained specialists). The arts teach children that there’s more than one correct answer or solution to a problem. In my grade one class at the Calgary Jewish Academy, we have “make a mistake day” where kids purposely make a mistake on a piece of paper. They then hand it off to each other. Their task is to “think like an artist” and turn the mistake into something interesting. Art involves problem solving, and it really is about process, not product. WP: What are the most important reasons to keep the excitement and act of drawing alive throughout childhood and beyond? I think the most important reason is that it can give us joy. We need to be creative, and it’s very satisfying to make those marks and put our ideas on paper. Art can also be a form of meditation and prayer. Personally, it quietens me and makes me appreciate what’s around us. For me the most important part is the process of making the art work; of getting lost in really looking at something and deciding what marks to put down. At times it’s the unexpected opportunity that arises in a work. Give your children opportunity to learn from experienced artists and teachers. Enroll them in a class. Take your children to art galleries. The cultural atmosphere in Calgary is exciting. Go along 11th Avenue or head down to Art Central in downtown Calgary. The galleries love having people come in and it’s free! When discussing your child’s work use open-ended questions like- “Tell me about your painting” rather than, “I like your cat” when really they were trying to draw a cow. Self-publish cards with your kids’ work on it. Use the cards for teachers, birthday cards, etc. Allow children’s work to be what it is—children’s work. Celebrate that and don’t expect it to look like an adult’s piece of art work. Alice S. Helwig is an artist and art educator. She resides in Calgary Alberta Canada.